Weekend trip to Wimberley was not long enough. We left Corpus Christi Friday at 10:35. First stop is Starbucks of course. Temp is 80 degrees. About 48 miles outside of town, we saw thick black smoke ahead of us. Not a good sign. Something was burning. Found a Toyota on fire on the side of the road. The whole front end was smashed and black. Looks like everyone got out OK. Emergency crew was on scene working on the fire. We prayed for the ones who did not make it to their destination. 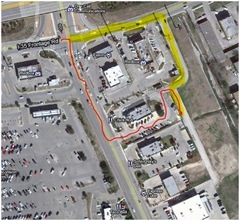 Made it to New Braunfels around 1:40 and stopped at Chick-fil-A for a quick lunch. Getting parked was a little challenging. We took the Walnut Street Exit off I-35, turned right on Walnut and saw the Chick-fil-A, turned left into their parking lot then realized we had a 34 foot trailer behind the truck. OOPS! We maneuvered to a road behind Chick-fil-A. The red line shows our path. Lesson learned – Pull over first, then use the iPad to look up the location on Google Map to map out an approach. The yellow highlight would have been easier. We traveled North on loop 306 out of New Braunfels and took Purgatory Rd to head East. Road was recently resurfaced so it was smooth. We did encounter several large dips along the way adequate signage made the route manageable. 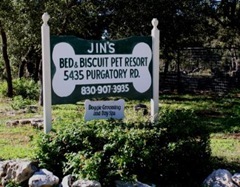 We did find Jim’s Bed & Biscuit Pet Resort. Pretty swanky place. Checked into Priddy Meadow RV Park in Wimberley about 3:00 and was fully set up by 4:00PM. Priddy Meadows has 15 sites, we had slot 12. Qianna and Cody are in the foreground. Sites are small and pretty close together. Neighbors appear to be permanent residents. Temperature was in mid 90’s at 7:30PM – sure hope it gets cooler over night. Drove into town for diner at Wimberley Cafe. $35.00. Yummy yummy. J had special – meatloaf, mashed tatters, buttered carrots. C had salad with chicken. For desert J had Rhubarb Pie, C had Cheese cake Brownie. We did nibble on a side of fried sweat tatters. They were crispy good. Also got groceries and diesel at Brookshire Bros. $3.79/gal. Also got groceries. Saturday was a good day. Ladies did some shopping ( which included a little spending ). Brother came for a short visit to pick up a pen I made for Tammy/David wedding. Then he came back for another visit because he needed a break from his ladies and their wedding prep stuff. J got flag mounted on RV, fixed mud dauber screens on refrigerator vents, mounted flexi-lead hangers, and proceeded to crack medicine cabinet mirror while drilling a hole for door pull. Yes, J used a special carbide drill bit designed for glass. Wedding was very nice. Had a Celtic twist including bag piper to greet guests at reception. 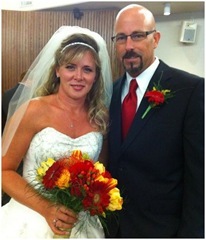 Congratulations Tammy and David. BBQ from Salt Lick’s in Dripping Springs was yummy for the tummy. Brother and wife are coming by Sunday to share leftover BBQ. Tonight we sleep 4 adults, a 7 y.o., two big puppies, and a cat. We get owner’s suite. The rest will fend for themselves. Of course the puppies will get the floor on either side of our bed. Sunday church at Wimberley UMC. Pastor Dana Hamilton recently moved to that church from Corpus Christi. We arrived very casual (shorts) and fit right in. Great service and very friendly people. 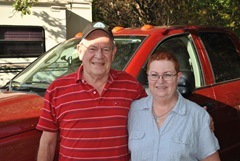 Meet a couple of folks who asked us lots of questions about living in an RV. J’s brother and clan came with leftover BBQ. We ate in shifts. Got caught up on family and the happenings around Sonrise Meadows. Enjoyed their visit. Youngest daughter and grandson took left for Corpus Christi. Eldest daughter left to catch the rest of her family in New Braunfels. So with a quiet afternoon, J took his afternoon nap & C did more techy stuff. She is learning how to move audible books between her iPhone and iPad. Dave E. Who we met at church came by and we talked about trucks, trailers etc. as they are planning to full-time next year. Enjoyed the sharing what we have learned. J sent him several links to more info for their research. Hope to see them on the road sometime. Monday morning C slept in then we went to breakfast at Wimberley Cafe. It was full so we waited for a table. Got back to home about 10:15 and are on the road at 11:15. An hour to load and hitch is pretty good. C packs the inside, while J stows the outside stuff. Last step is hitching up. C does a good job backing the truck. Arrived back home in Corpus Christi around 2:40PM. Unhitched trailer and refueled the truck. $3.89/gal. Thanks for riding along. We leave you with this parting shot out our back window.